Oh yes, you’ve heard me lament over the hot weather delaying my photo shoot. You have seen a photo after I finally got cooperating weather. Now, you get all the info! Today is release date for Pigwidgeon. I had so much fun designing and then knitting this one up. I think I have mentioned on here (maybe not), I am obsessed with colorwork right now. Like, I want to knit it…all the time. So, I was thinking about a top down, in the round jumper for little kiddies and then I was thinking…hmmm, owls. I love spunky little owls. 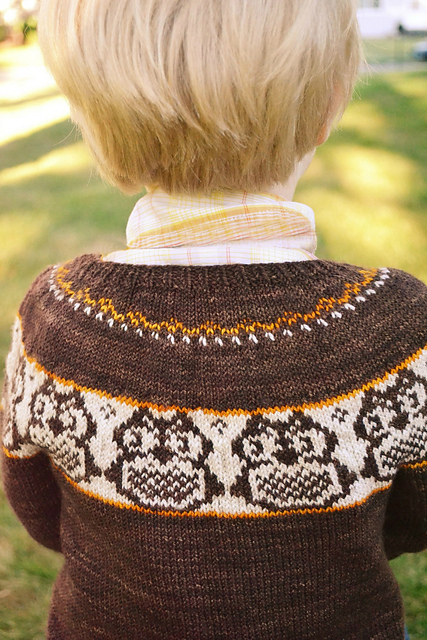 So, I charted a spunky owl, swatched him about a 100 times, and then designed the sweater and the rest is history. The motif, just seemed to scream PIGWIDGEON. So, I started calling my project Pigwidgeon and then it just stuck. I felt that I couldn’t name it anything else. The color possibilities are so completely endless on this. I chose a fall color palette. Though, I can see this in a wide variety of colors. The contrast colors use partials and could probably use up scraps in the stash. The yarn used in the sample is Sunshine Yarns Classic Sock and it is absolutely fabulous. It worked wonderfully for colorwork. It is such a pleasure to knit with and it blocks to an absolutely gorgeous fabric. I linked the website for a reason. Go! Run! Order! You’ll love it! I mean it! Ok, enough exclamation points. Yes, he does look cool doesn’t he. It took several cookie bribes to get him to stand still, but he finally complied. Now, keep in mind the color combos possible. I just happened to have a boy sitting around to model. As a unisex sweater, a girl could totally rock this look too. There are short rows to raise up the neck just a bit. Worked top down, this is sweater really is minimalist on the finishing. It is so nice sometimes, to finish a sweater and no have anything else to do! And here is the money shot! He even smiled and looked at the camera, at the same time! Don’t let colorwork intimidate you. I used to think it was too hard. Obviously, I was wrong. When doing the colorwork sections, I use the Philosopher’s Two-handed method. Though, you can do it one hand at a time, it just takes a little longer but is still fun! Thanks so much for stopping by and don’t forget about the KAL. It starts October 1st in my group. This pattern also qualifies for the sale too. Remember to use code: STOCKPILE2012 at checkout to get the 20% discount. Yes a KAL!!! I’m talking about a KAL…in a minute. First off, I thought I’d let you all know that I got that cool day that I wanted. 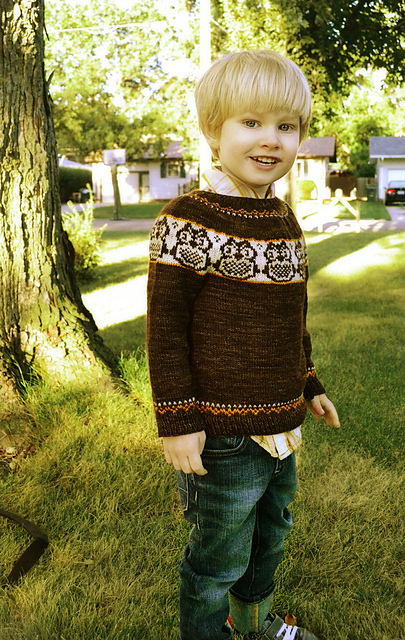 Got some fabulous modeled pics of the sweater and it is nearly ready for release! Now on to this KAL business… During October, the Malabrigo Junkies group on Ravelry has a big KAL, called October Stockpile. It’s always lots of fun and has a lot of participants and PRIZES! It’s designed for people to start their holiday knitting and focuses on 1 skein projects. To go along with it, they let designers and yarn purveyors a chance to run sales. I am happy to let you know that I am participating in this sale and will be offering 20% off any of the single patterns in my shop using the code STOCKPILE2012 at checkout. Sorry, the ebook isn’t on sale as is already a really good buy (more than 20% off the cost of the single patterns) 🙂 What I would also like to do is encourage anyone knitting my patterns in October (using Malabrigo or any kind of yarn) a place to stop by and KAL. I will host this in my group here. So, come by, join my group and later today I will be posting a thread about the KAL. I’ll ask you to sing up in the thread by stating which pattern you will be knitting and I’ll add you to a list of Stockpile participants. At the end of the month I will have a couple of random yarn giveaways and every participant in the KAL will receive a coupon code for 50% a future pattern purchase! Now, just to be clear, I am in no way trying to steal Stockpile participants. 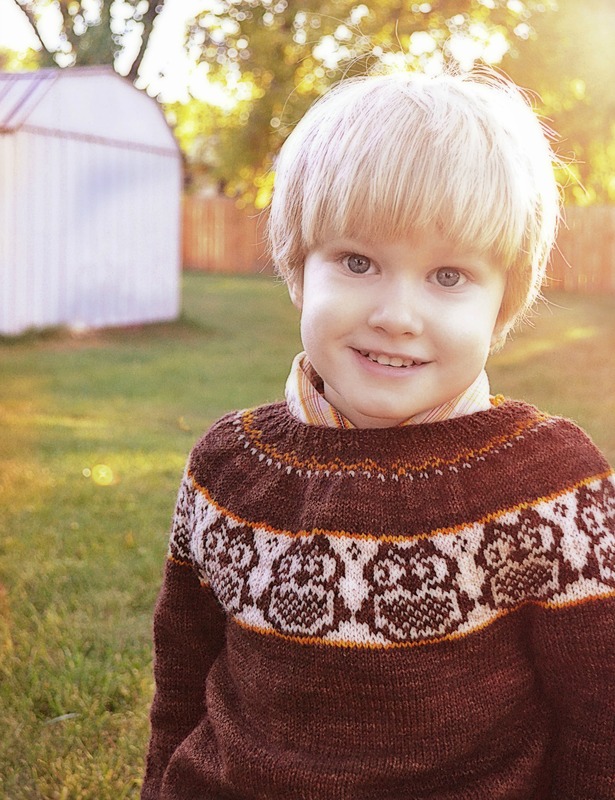 If you are knitting one of my patterns in Malabrigo, by all means, participate in both! It’s lots of fun!